Its all pretty much Plymouth Citybus this week as we get the Cornish side of their network changes happening on the 4th September. There are a couple of changes to Falmouth University routes on the 11th which would normally fall within this period, but First have yet to reveal any details of what is happening so they will be in CT45 in two weeks time, along with the rest of the Kernow changes. I guess I have a busy two weeks ahead of me! No new notices on VOSA from the last two weeks. 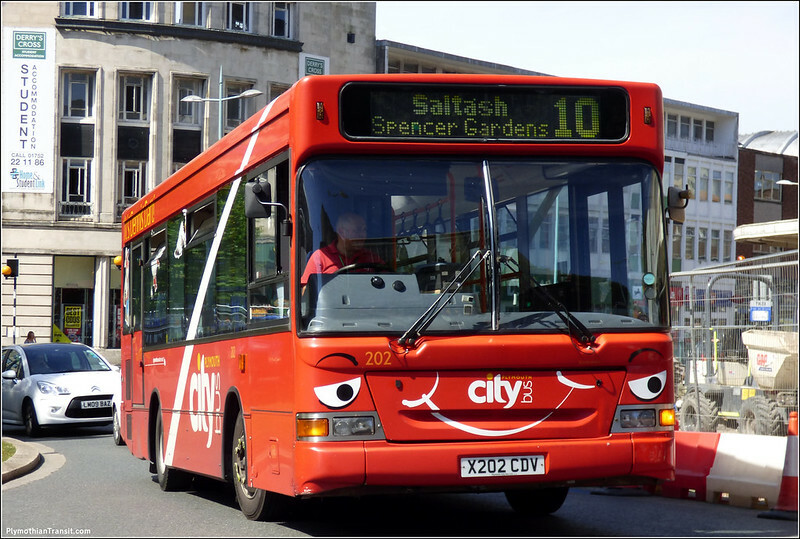 After the introduction of a the new service 5 between Saltash and the City Centre via Devonport, service 10 will be withdrawn due to low passenger numbers. 11 – Reduced back to an hourly frequency from every 30 minutes. Although we have seen good growth since increasing the frequency to every 30 minutes, there was not enough growth to make it sustainable. 11A –Liskeard to Padstow service. This will still be an hourly service with minor amendments to the timetable. This will link with service 11 in Liskeard to provide through journeys from Plymouth to Padstow. 12 – Reduced back to an hourly frequency from every 30 minutes. Although we have seen good growth since increasing the frequency to every 30 minutes, there was not enough growth to make it sustainable. Service 12 will run between Plymouth & Launceston via Stoke Climsland. 12A – Will run from Plymouth and will follow the existing 78/78A route but will provide passengers in Downgate, Callington and St Dominic direct trips into Plymouth. 12B – Launceston to Bude will continue to run the existing timetable and route but the timetable will see some minor amendments. This will link with service 12 in Launceston to provide through journeys from Plymouth to Bude. Will now serve Western Approach once it has departed the Railway Station. It will then drop off at Derrys Cross Roundabout and then serve stop A3 as normal before heading to Torpoint. 71A –Withdrawn as a summer service only. 72 – Introduction of the winter timetable and the withdrawal of the Sunday service. To get to Looe from Plymouth on a Sunday please use service 11 to Liskeard then service 73 to Looe. 73 extended to Liskeard Morrisons and Liskeard Hospital at the request of passengers. 73A introduced to provide of a morning and afternoon school time journey via Widegates and Looe School. 74 – Additional journey in both directions, including a journey in both directions direct into Plymouth. 201 36 38 withdrawn and parked on lower yard gravel with the other Darts withdrawn earlier in the year. The map for the 74 seems to show a short double run in Tremar. Does this actually happen? Rumours of Dennis's Denise greatly exaggerated - he's out and about on the 25 today, and sends to have lasted the whole day without breaking down, which is more than can be said for some of the Oppies!